So if you follow the weather in the US you know that we seem to be having another mini ice age. Cabin fever has set in big time. But this isn’t a complaint about productivity or cannibalism. I decided to spend a little money and move my game prototype from sleeves and paper with text to actual cards and non scrounged up tokens from my own board game tokens. So I made mock ups of the cards in photoshop and sent them out to Printerstudio. The cards came back and they were excellent and pretty reasonable as far as price goes. I bought some wound tokens and other items from MeepleSource and those arrived and work great. But while I was waiting for the cards and tokens a funny thing happened. I just sat down and started writing out the rules for the space strategy game that I have had in the back of my mind for a long time. And like Athena, it just sprung from my head fully formed onto the pages. So within a day I had the rules. 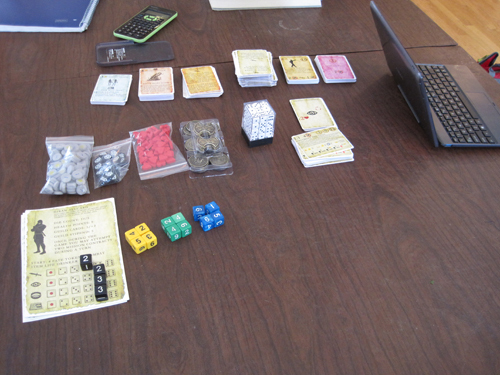 Within two days I had a prototype of a scavenged pieces up and running. So now I don’t know what to do. I’m going to have to choose one to move forward with and it needs to be a winner. Both games are 2-4 players and have a nice mix of conflict and solo goal based play elements. What I mean by that is you can choose to interact with other players or try and just play the system and go after victory points. Figuring out when to do either is part of the strategy puzzle. One is fantasy themed with swords, magic and a really clever push your luck mechanism. It’s got some light rpg level up mechanics in which your “character” gets stronger as you acquire weapons, skills, spells, allies etc.. So you have to balance that with actually going after the objectives that will win the game. The other is a mini space opera game with a tile based sector map, capital ships, attack dice, pd/ew dice and space carrier dice. It’s got lots of resource cubes and operation card piles that you have to set up and advance to have fleet battles and invade planets. You can expand and exterminate or just trade and mine exotic resources from planets you explore and claim. You have 2 secret objective cards that you get from your high command and if achieved give you bonus Victory Points when the end game trigger goes. That’s just scratching the surface for both games actually. I’m going to have to pick one to push forward on. Having researched the production process a bit, the component list for both these games is pretty similar and will be a decent capital investment. I’m going to keep playing and testing both before I make a decision. Won’t be anytime soon at least.